Ok, I want to know what's the deal with both characters, Pochacco and Keroppi? Is it me or was it told through the Sanrio community that Pochacco and Keroppi have been discontinued. Recently, I have taken a trip to Sanrio's online USA website and Sanrio was selling new things of Pochacco and Keroppi. So, my big important question is - Are Pochacco and Keroppi back in production? 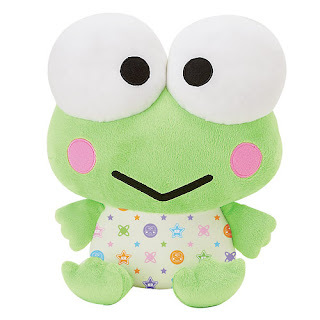 Actually, I cannot find this other picture of a weird looking green colored Keroppi plush that is being sold in Sanrio stores this year. Let me tell you that must have been the most awful looking Keroppi plush I have ever seen. 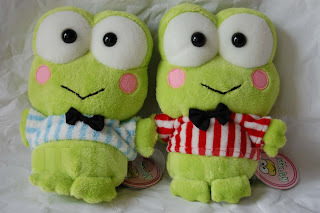 Back in 2005, at least the Russ company designed a pretty good looking Keroppi plush. Take a look below. Isn't this 10X better than above?? 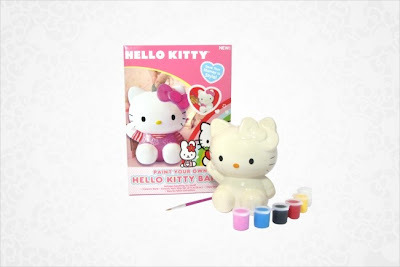 Sanrio, make beautiful design quality products instead of trying to make your potential buyers do the work for you! Sheesh. It's like they have run out of ideas and this is what they have come down to. Thankfully, not all Sanrio products have failed. ^ The design of the Keroppi bed set is really good looking. I'd definitely buy it. Definitely, a pleaser for any Keroppi fan, no matter the age. I think what really works for this design is that it's mainly white. A really good choice. Also, I love how the white compliments well with the bright neon green bedsheets. And that white photo frame above the bed is so freakin' cute. Pictures like this gives me a great idea to search for that kind of white photo frame and just stick a Keroppi picture just like the bedroom scene above. If Sanrio is bringing back Keroppi and/or Pochacco, why not bring back some old favorites like Tuxedo Sam and Pippo?